The Armenians are a culturally isolated population who historically inhabited a region in the Near East bounded by the Mediterranean and Black seas and the Caucasus, but remain underrepresented in genetic studies and have a complex history including a major geographic displacement during World War One. Here, we analyse genome-wide variation in 173 Armenians and compare them to 78 other worldwide populations. We find that Armenians form a distinctive cluster linking the Near East, Europe, and the Caucasus. 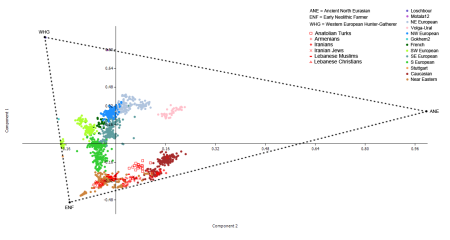 We show that Armenian diversity can be explained by several mixtures of Eurasian populations that occurred between ~3,000 and ~2,000 BCE, a period characterized by major population migrations after the domestication of the horse, appearance of chariots, and the rise of advanced civilizations in the Near East. However, genetic signals of population mixture cease after ~1,200 BCE when Bronze Age civilizations in the Eastern Mediterranean world suddenly and violently collapsed. Armenians have since remained isolated and genetic structure within the population developed ~500 years ago when Armenia was divided between the Ottomans and the Safavid Empire in Iran. 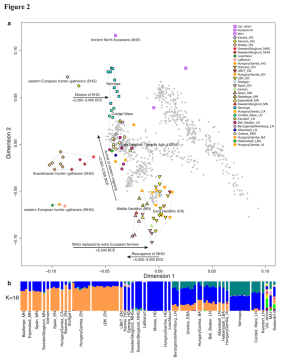 Finally, we show that Armenians have higher genetic affinity to Neolithic Europeans than other present-day Near Easterners, and that 29% of the Armenian ancestry may originate from an ancestral population best represented by Neolithic Europeans. Unfortunately, the authors failed to even mention the main cause of what they're seeing; the massive influx of Ancient North Eurasian (ANE) admixture into the Near East. They included ancient genomes Oetzi the Iceman and La Brana-1 in their analysis, but not MA-1 or Mal'ta boy, the main ANE proxy. The differences aren't very dramatic, but they're consistent and, as per the PCA, hard to overlook. Indeed, the contrast would be even more obvious if we were to add to the list other exotic admixtures, such as East Asian, South Asian and/or Sub-Saharan. If you're wondering why it is that Muslims generally carry more ANE than their non-Muslim neighbors, it's probably because the Islamic expansion had a homogenizing effect on the Near East, and it didn't have as much of an impact on the religious minorities in the region. How and when ANE arrived in the Near East is still a mystery which can only be solved with ancient DNA. However, my bet is that most of it came after the Neolithic from the Eurasian steppe, the northeast Caucasus and the Altai, with the Indo-Europeans, Kura-Araxes people and Turks, respectively. Linguists have long agreed that languages from English to Greek to Hindi, known as 'Indo-European languages', are part of a language family which first emerged from a common ancestor spoken thousands of years ago. Now, a new study gives us more information on when and where it was most likely used. 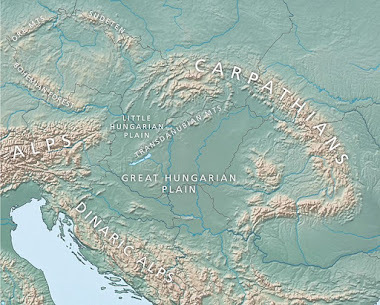 Using data from over 150 languages, linguists at the University of California, Berkeley provide evidence that this ancestor language originated 5,500 - 6,500 years ago, on the Pontic-Caspian steppe stretching from Moldova to Russia and western Kazakhstan. 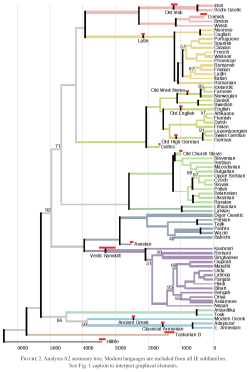 "Ancestry-constrained phylogenetic analysis supports the Indo-European steppe hypothesis", by Will Chang, Chundra Cathcart, David Hall and Andrew Garrett, will appear in the March issue of the academic journal Language. A pre-print version of the article is available on the LSA website [see HERE]. Chang et al. examined over 200 sets of words from living and historical Indo-European languages; after determining how quickly these words changed over time through statistical modeling, they concluded that the rate of change indicated that the languages which first used these words began to diverge approximately 6,500 years ago, in accordance with the steppe hypothesis. This is one of the first quantitatively-based academic papers in support of the steppe hypothesis, and the first to use a model with "ancestry constraints" which more directly incorporate previously discovered relationships between languages. Discussion of prior studies in favor of and against the steppe hypothesis can be found in the paper. I'm reading the paper now, and it'll probably take me a while to get my head around it. Admittedly, linguistics is not my strong point, but I might post some observations in the comments if I feel up to it. In any case, here's one of the phylogenetic trees from the paper. It'd be interesting to see how it lines up with thousands of complete Y-chromosome sequences from these language groups, particularly from Y-haplogroup R1; I have a feeling we'd see some very nice correlations. Chang et al., Ancestry-constrained phylogenetic analysis supports the Indo-European steppe hypothesis. Manuscript to be published in Language, (Vol. 91, No. 1) March 2015. I'll probably end up writing a whole series of posts on this paper. But for now, here's the abstract and a PCA. We generated genome-wide data from 69 Europeans who lived between 8,000-3,000 years ago by enriching ancient DNA libraries for a target set of almost four hundred thousand polymorphisms. Enrichment of these positions decreases the sequencing required for genome-wide ancient DNA analysis by a median of around 250-fold, allowing us to study an order of magnitude more individuals than previous studies and to obtain new insights about the past. We show that the populations of western and far eastern Europe followed opposite trajectories between 8,000-5,000 years ago. At the beginning of the Neolithic period in Europe, ~8,000-7,000 years ago, closely related groups of early farmers appeared in Germany, Hungary, and Spain, different from indigenous hunter-gatherers, whereas Russia was inhabited by a distinctive population of hunter-gatherers with high affinity to a ~24,000 year old Siberian6. By ~6,000-5,000 years ago, a resurgence of hunter-gatherer ancestry had occurred throughout much of Europe, but in Russia, the Yamnaya steppe herders of this time were descended not only from the preceding eastern European hunter-gatherers, but from a population of Near Eastern ancestry. Western and Eastern Europe came into contact ~4,500 years ago, as the Late Neolithic Corded Ware people from Germany traced ~3/4 of their ancestry to the Yamnaya, documenting a massive migration into the heartland of Europe from its eastern periphery. This steppe ancestry persisted in all sampled central Europeans until at least ~3,000 years ago, and is ubiquitous in present-day Europeans. These results provide support for the theory of a steppe origin of at least some of the Indo-European languages of Europe. Harvard Professor David Reich is holding a seminar later today at Jesus College, Oxford, on the population history of Europe. Part of the talk will focus on unpublished genome-wide data from 69 ancient remains from Germany, Hungary, Russia and Spain, as far as I know mostly dating to 6,000-1,000 BC (see here). I'm hoping that Professor Reich might also reveal a few details, or at least give us some clues, about the Y-haplogroups of these prehistoric individuals. It would be interesting to find out, for instance, which of the samples belong to R1b, the most common Y-haplogroup in Europe today, but thus far missing from ancient European DNA older than the late Neolithic. It's likely that some of the people attending the seminar will blog or tweet about it soon after it's over. I'll try to compile the most useful of these reports in an update tomorrow. Feel free to help me out in the comments section below. However, please keep the discussion firmly on topic. Update 09/02/2015: Jean Manco, author of the recent book Ancestral Journeys, is sharing her notes from the lecture here. Paraphrasing David Reich, she says that Yamnaya brought both R1a and R1b to Europe. If anyone reading this is going to the Annual Meeting of the American Association of Physical Anthropologists (AAPA) in St. Louis next month, I'd love to know what was said at the following presentations. MARTINA UNTERLÄNDER1,2, SUSANNE KREUTZER2 and CHRISTINA PAPAGEORGOPOULOU1. 1 Department of History and Ethnology, Demokritus University of Thrace, 2 Palaeogenetics Group, Institute of Anthropology, Johannes Gutenberg-University of Mainz. The present paper investigates the origins of the Aegean pre-palatial civilizations (5th-3rd millennium BC) by applying cutting-edge methods of molecular biology and population genetics. The term Aegean Civilizations refers to the novel human lifeway (agriculture and craft specialization, redistribution systems, intensive trade) that appeared during the end of the Neolithic and the beginning of the Bronze Age in the Aegean. Although many studies exist on archaeological constructions of ethnic and cultural identity on mainland Greece, the Cyclades and Crete, not enough efforts have been made to explore this direction on a population history basis. We have investigated Late, Final Neolithic and Early Bronze Age human skeletons (n=127) from the Aegean using ancient DNA methods, next generation sequencing (NGS) technology and statistical population genetic inferences to i) gather information on diversity, population size, and origin of the pre-palatial Aegean Cultures, ii) to compare them on a genetic basis, in terms of their cultural division (Helladic, Cycladic, Minoan) and iii) to investigate their ancestral/non-ancestral status to the Early and Middle Neolithic farmers from Greece. In addition to mitochondrial DNA genomes, by applying a capture-NGS approach we collected information on functional traits of the early Aegean communities in southeastern Europe. Considering the International Spirit that overwhelms the Aegean during the 3rd millennium BC, seen by the wide distribution of artifacts, this palaeogenetic approach provides valuable new insights on population structure of the groups involved in the Neolithic-Bronze Age transition and the spread of specific alleles in this part of Europe. IAIN MATHIESON1, WOLFGANG HAAK4, NICK PATTERSON1,2, SWAPAN MALLICK1, BASTIEN LLAMAS4, NADIN ROHLAND1, EADAOIN HARNEY1, SUZANNE NORDENFELDT1, KRISTIN STEWARDSON1, IOSIF LAZARIDIS1, JOSEPH PICKRELL9, ALAN COOPER4, GUIDO BRANDT5, NICOLE NICKLISCH5,6, HARALD MELLER6, KURT W. ALT5,6,7,8 and DAVID REICH1,2,3. 1 Department of Genetics, Harvard Medical School, 2 Broad Institute, 3 Howard Hughes Medical Institute, Harvard Medical School, 4 Australian Centre for Ancient DNA, University of Adelaide, 5 Institute of Anthropology, Johannes Gutenberg University of Mainz, 6 State Office for Heritage Management and Archaeology Saxony-Anhalt and State Heritage Museum Halle, 7Institute for Prehistory and Archaeological Science, University of Basel, 8 Danube Private University, 9 New York Genome Center. One of the most exciting consequences of recent developments in ancient DNA technology is that we have the ability to infer the phenotypes of ancient samples for traits that cannot be reliably inferred from skeletal remains. Important examples include pigmentation traits, dietary traits like lactase persistence and amylase copy number, and disease resistance mutations. 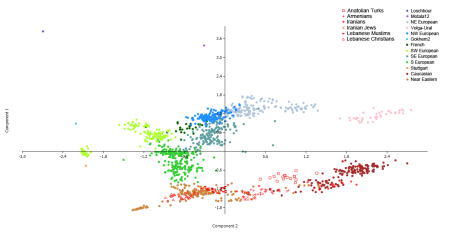 These have relatively simple genetic architectures, but by using information from genome-wide association studies, and by genotyping many more sites, we can also predict the values of polygenic traits that are controlled by many loci, for example height, weight, and complex disease susceptibility. By investigating how they change through time, we can disentangle the effects of natural selection and population turnover in the evolution of these traits. In this study, we present genetic data from a series of samples from seven archaeologically defined cultures in central Europe, ranging from 8000BCE to present. We have genotyped these samples at 390,000 genomic loci, including 30,000 which have known phenotypic effects. We then use this data to distinguish between traits that have changed consistently with population turnovers, traits that have changed apparently neutrally, and traits that have changed dramatically due to recent natural selection. Finally, we investigate whether we can detect selection in polygenic traits like height or weight. These data demonstrate a powerful new source of information about ancient samples, and have the potential to teach us both about the specific traits of these populations, and also about the general mechanisms of evolution and adaptation in human history. Also worthy of note is this talk on ancient genomes from the Peruvian Andes. The study appears to be another nail in the coffin of old school physical anthropology. LARS FEHREN-SCHMITZ1, PONTUS SKOGLUND2, BASTIEN LLAMAS3, SUSANNE LINDAUER4, ELSA TOMASTO5, SUSAN KUZMINSKY1, NADIN ROHLAND2, SUSANNE NORDENFELT2, SWAPAN MALLICK2, ALAN COOPER3, NICK PATTERSON2,6, WOLFGANG HAAK3 and DAVID REICH2,6,7. 1 Department of Anthropology, UC Santa Cruz, 2 Department of Genetics, Harvard Medical School, 3Australian Centre for Ancient DNA, University of Adelaide, 4 Curt-Engelhorn-Center for Archaeometry, 5 Departmento de Humanidades, Pontificia Universidad Católica del Perú, 6Broad Institute of Harvard and MIT, 7 Howard Hughes Medical Institute. Despite recent advances in archaeology and population genetics, the number of human dispersals into South America and the routes these settlers took throughout the continent remains subject to controversy. The analysis of DNA from ancient human remains has proven to be an efficient tool to get insights into such ancient population dynamic processes. However, ancient DNA research in South America so far has been mostly restricted to the analysis of the mitochondrial control region and samples 5000 years old and younger. While these studies have increased our understanding of the pre- Columbian population history, inferences have been restricted to female population dynamics and have not allowed us to address relevant aspects like admixture and selection properly. 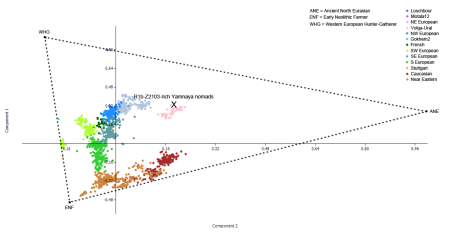 Here, we present genome wide data from pre-Columbian Central Andean individuals from various archaeological sites dating from 7000 BC to 1100 AD. 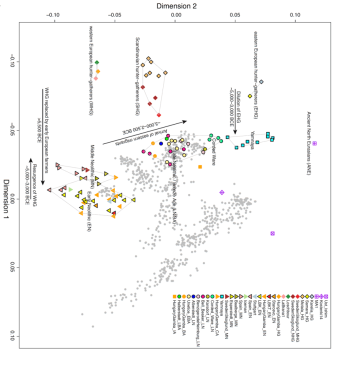 Ancient DNA genomic libraries were analyzed employing both shotgun sequencing and targeted hybridization capture approaches. We compare this data with published genome-wide data from ancient and modern Native American populations and reconcile our results with craniometric studies. Our results show a striking genetic continuity in the Andes over at least 8000 years despite observed changes in cranio-morphological variability. Additionally, our observations support the hypothesis of a single-wave scenario, in which the early and later populations of pre- Columbian South America derived primarily from a single source population. The AAPA 2015 website is here. You can download a PDF book with all of the abstracts here.